Holidays straight out of Swallows and Amazons spring to mind at High Sand Creek campsite in Stiffkey on the north Norfolk coast. With miles of marshes just outside your tent, the potential for a real-live adventure is huge. The site itself is very pared-down, but that doesn’t mean that your opportunities for a top family holiday are limited. Plus the flat, slightly melancholic, beauty of the marshes, shimmering with dusky purple marsh heather, is magnetic. The site has been in the same family for 40 years, and is much loved by families, who return year after year with multiple generations tacked on to augment their numbers. This stretch of the Norfolk coast is heaving with things for kids and grannies to do together. Families love the fact that there are so many opportunities for swimming and picnicking, and there’s also crabbing, sailing, fishing and seal-watching to keep everyone fully occupied. To top it off, at the end of the day, with salt in your hair, you can go to sleep safe in the knowledge that there’s nothing at all between you and the North Sea. Not our idea of cool camping! The campsite is set out with pitches on top of each other and no vegetation to separate pitches. (Everyone just walks across everyone else's pitch!) Some pitches near the hedgerow might be good for families or looking across the marshes and it is a good location to get to the beach but if you want any privacy and don't want to feel like you are camping in a carpark, it would be better to find a smaller campsite else where along the Norfolk coastline. Nice size pitch, excellent facilities block, lovely woody area for children to play in, close proximity to the beautiful marshland (we chose the wrong time to go for the sea though, miles away! ), nice friendly and calm atmosphere. Would defo recommend. 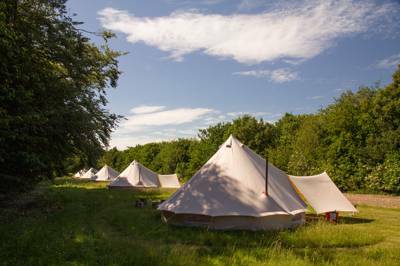 At £22 per night for two people it's on the pricier end of the campsite spectrum. I'd expect electric hookup for that money but there was none. Price aside we were left with a problem because signs at reception and indeed the lady booking me in said no burning wood. When your only non-electric cooking stove works by burning sticks and pine cones and you have a fridge full of meat to cook for your weekend's meals what are you supposed to do? Since the campsite has no website where you could learn the site rules and I wasn't told about the wood-burning policy when I phoned and booked, I didn't feel guilty about burning sticks to cook two breakfasts and evening meals. That they'd rather people used flimsy tinfoil disposable barbecues than a professional wood gas camping stove is just bizarre. So I'd have to sum up by saying the site is expensive and not prepared to let campers do the one thing you'd associate with camping - have a campfire. Lovely site. Nice and quiet at night and very flat. The toilets and showers were amazing. Really clean, and lots of hot water. Although we normally go to smaller sites than this, we would go back here again. I really like this campsite. A genuine welcome from the moment you arrive High Sands Creek has generous pitches, and plenty of good clean facilities. The kids loved the woods which run alongside the campsite, with its trees to climb and rope swings to have fun on. Ideally suited on the Norfolk coast, there is a lovely walkto Wells next the Sea, but with the kids it does feel a bit longer than the three miles it says it is! The Red Lion in the village isn't cheap but family friendly and a nice pint. 3 times we've been here & it never gets boring. 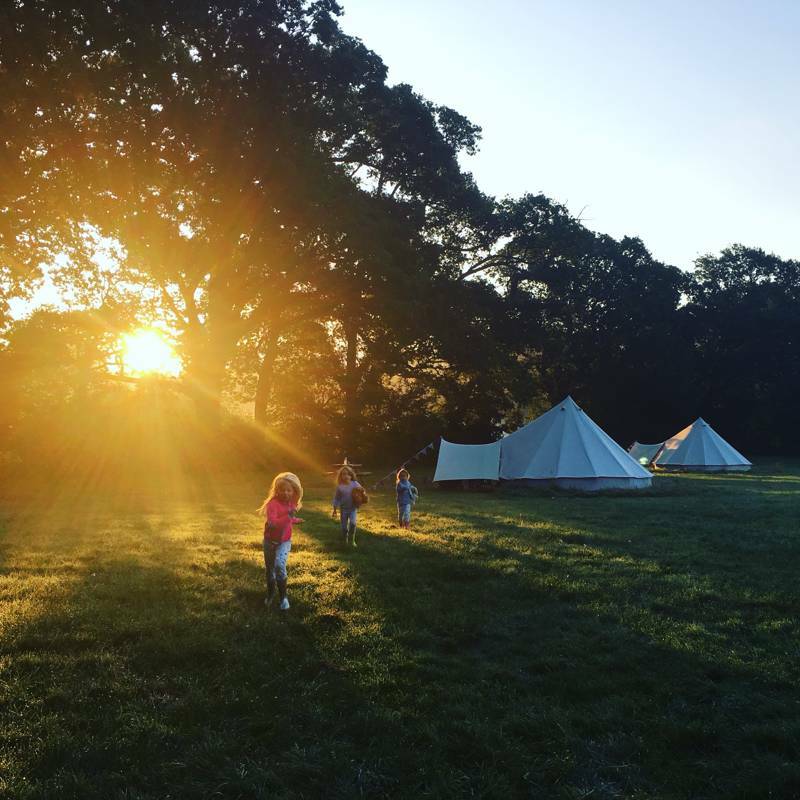 The kids love it, there's so much to do in the area a short distance away from the campsite & I feel we've been spoilt with North Norfolk which means nowhere can better it. This site is clean, well managed & could be described as basic, but not in a derogatory way. The clear night skies are the best in the country & we've even seen the Northern Lights! Rain or shine there is plenty to do whatever the budget. I agree with another review on here that the local shop doesn't offer as warm a welcome as the campsite or the Red Lion, which is a shame because they sell some lovely things, but their customer service leaves a lot to be desired. Don't let this put you off, just go elsewhere for any essentials you need because on the whole the area is a brilliant place to visit & this campsite a perfect base. Just returned from a brilliant week at High Sand Creek. The site is fairly basic but has everything you need. Loads of hot water in the toilet block and washing up room. The site adjoins Stiffkey Marshes which offers great crabbing. We cycled along the coast path to Wells next the sea and on to Holkam as well. Great fun. Only advice would be to request a pitch away from the Sycamore trees. Our tent was covered in sap. Have visited this site as a couple, a family and in a group of mature adults celebrating a significant birthday and in all cases it came up trumps all round. 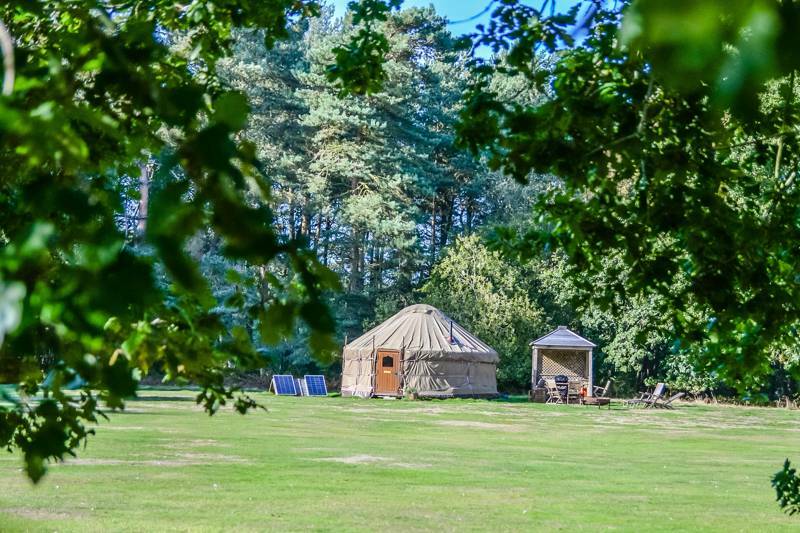 Generous sized pitches and ability to group tents, campers and gazebos in a circular more private way. Staff very helpful and facilities, whilst basic, were very good and spotlessly clean. When high winds were forecast the staff came to advise us and when the winds came in more suddenly they came to help anchor the gazebos. We camped near the marshes under the tree line and so our view out to sea was idyllic and we felt completely connected to nature. If you like a good walk there are lots of great walks out to the seal colony and along the coastal paths to Wells one way and Moreston and Cley the other. Nature reserves abound at every turn and great pubs everywhere we went for well earned rests and refreshments. I would go every year if I could. Think this is the fourth year we've been to High Sands and each time we've had a great break. It can get a bit hectic / noisy during bank holiday weekends, but this is perfectly contrasted with the silence of the marshes on the doorstep. We've been out at low tide and seen colonies of seals and, of course, the crabbing is excellent at high tide. The staff have had a reshuffle recently and the new team are a delight - no request seems to much for them (they even brought a whole toolkit down when our passenger window got stuck on open). The one downside this time was the local shop - stiffkey stores - has a fellow working there (owner, I think) who is rude to any customers with children (don't touch the books, they're for sale, you know). If that's you, I'd avoid like the plague. There's other (better) stores elsewhere (in Cley or Wells). 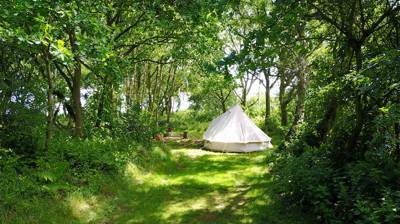 Friendly campsite perfectly located on the North Norfolk coast. Fantastic views of sunset over the marshes, particularly from the western side of the site. Facilities nothing special but clean and serviceable. It's essentially a square field, so not much character, but there is plenty of space: it was full the weekend we visited but campers were certainly not on top of each other as the pitches are very generous. If you want to visit the Red Lion, you'll need to book ahead: when we tried to book Saturday lunchtime for that evening, we were met with a firm no. Still, there are fine fish and chips to be had in Wells. This was a pleasant but quite formal campsite. The managers were very friendly, but also very precise about where and how we should set up. It’s very family orientated, with lots of large groups; but not too noisy late at night. The shower blocks are clean and I never had to queue. There are dryers but no washing machines (because of the marsh mud). One point on which I would disagree with the book is that the sea is really not ’just outside your tent.’ It’s a very long walk across the saltmarshes before you even reach the beach, as is typical for most of the resorts and villages along the north Norfolk coast. The Red Lion has a good menu, but you really need to book for an evening meal during holiday season. Also recommended are The Anchor in Moreston (the next village towards Cromer), and The Cornerhouse in Wells-Next-The-Sea, where the barman was perfectly happy to tolerate our well-behaved 5-year old, but actually asked a noisy family to leave. The food there was fab and the toilets very interesting! It’s a few years since we’ve been to High Sand Creek but it used to be one of our favorites. 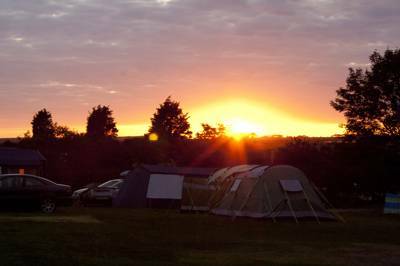 It’s a very simple campsite which can be a bit cramped in high season, but don’t let that put you off. The location is wonderful and the sunsets are amazing. Must visit the Red Lion pub which is in walking distance, has an excellent children’s menu and some of the best Woodforde’s Wherry in Norfolk! Sweet, super family-friendly site. No frills and no massive caravans. They made an effort to fit us in last minute during a crazy busy August weekend which was a nice contrast to the peevish and snippy responses to telephone enquiries at nearby establishments. We paid £16.50 p/night for two people with one tent and a car. I glanced into the laundry and it does look like they have a washing machine or two. Great access to marshes and about a 20 minute walk to ’beach’ (the tide goes in and out over miles of very flat sand) with a seal colony further out on a sand bar. Tents, small campervans and motorhomes. No caravans. Part of the site is given over to ball games, and toys, tennis racquets, footballs and such like are available in reception. You can also borrow crabbing nets and buy bags of bait. The thick hedge that separates the site from the marshes is a favourite spot for children to explore. 80 marked pitches spread over about 5 acres. Just four hook-ups available, as the aim is to keep the site as old-fashioned as possible. There’s a laundry for sink-washing clothes (but no washing machines), and 12 clean showers and 12 toilets divided into male and female blocks. Gas is available for sale, and there’s a freeze-pack service. 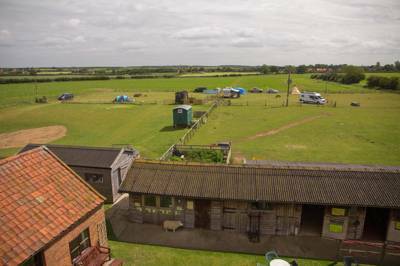 Gressenhall Farm and Workhouse (01362 860563) has a traditional farmhouse, cottages and village shop, and an adventure playground and cart rides around the farm. There’s a leisure centre at Hunstanton, as well as a Sea Life Sanctuary, with a good aquarium and otter and penguin sanctuaries. There’s a play centre in Wells, with a ball pool, and cinemas in Cromer and Fakenham. The Thursford Collection (01328 878477) near Fakenham is a wonderful selection of steam engines and Victorian fair rides, and Houghton Hall (01485 528569) is an impressively grand place to shelter from the rain. There are muddy creeks across the marshes that could be dangerous for smaller children. Also beware the marsh tides – check the tide table displayed in the warden’s kiosk. The coastal marsh is a haven for migrating birds, so expect to see a few twitchers twitching on the horizon. The Norfolk Coastal Path passes through Stiffkey, so the site’s popular with walkers. A bridge across a creek, just beyond the site, is a prime spot for crabbing. The creeks onto the marsh are muddy, so this is great for mudlarking. Further afield is Bressingham Steam and Gardens (01379 686900) near Diss, with a great selection of vintage engines and 3 narrow-gauge railway rides around the gardens there. Go Ape! High Wire Forest Adventure (08456 439162) is brilliant for the over-10s, with swings, zip wires and rope bridges to test your mettle. Hunstanton, on the West coast, is a classic Victorian resort with stripy cliffs and a good beach for rock pools and exploring. Click here for more activities, sights & attractions to see and do in Norfolk. The village shop stocks basic groceries. The Red Lion Pub is within walking distance and does good food; there’s also a playground near by (01328 830552). There’s often a fish stand at Morston for local cockles, and there are excellent dressed crabs for sale in Blakeney. Wiveton Hall Café, just beyond Blakeney, does exceptionally good food, almost all grown locally; the artichoke bruschetta and raspberry pannacotta are particularly good. Take the A149 into Stiffkey village. Go through the village, with the sea on your right. The site is just after the Red Lion pub on the right. Very limited. Take the train to Sheringham then hop into a taxi. The site is happy to provide details of local taxi firms if you phone ahead.